What's the difference between Internet providers? We're often asked about the different options available for Internet access. You may be moving your office, or perhaps you need an upgrade in speed and reliability because you're going with a VoIP phone system. You may also have moved to a cloud-based mission critical business application and you want a secondary connection for redundancy. Typically the speed of the connection is the most obvious factor, but there is more to consider. Low cost "best efforts" services. These are business services which are slightly better than the home services, but essentially using the same technologies as offered to homes, but a good fit when low cost is higher priority than reliability, uptime, and high priority service restoration. These services include Comcast “Business Class”, Verizon FIOS, all DSL services. Generally these services are attractively priced, provide pretty good uptime, but service interruptions can and do occur. Comcast business does have outages that can be hours, and if you have an interruption on say a Friday night, you might not get service restored until sometime on the next business day (possibly not until later in the day). Verizon FIOS is excellent, but even so, we have seen rare situations where service was down for days. High reliability/ fast response/ high priority services. These are services intended for customers for whom uptime, high reliability, and service responsiveness are of paramount importance. These types of services require what they call "5 nines" reliability ( 99.999% ) uptime. Examples of such services include traditional T1 circuits, and now Lighttower, and Comcast Enterprise fiber products. These solutions are provided as a result of better quality equipment, redundancy, better monitoring of circuits, quick failover, and adequate staffing, better training, and also high priority of service response. These services have what is called a Service Level Agreement (SLA) which provides guarantees of reliability and fast service restoration. You pay a premium for this, but the benefit is uptime is virtually guaranteed, and outages are in minutes per year rather than frequently hours or possibly days of outage in a year. 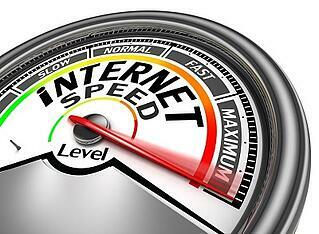 We advise planning weeks in advance to change or add an Internet provider. Also consider that many office locations don't have all the options you may be expecting. Before considering new office space, make sure you can get the connectivity you want at a price that fits your budget. Also, even if you aren't planning any business changes, if its been years since you last made a change, you may be pleasantly surpised to get a lot more performance for even less cost than you're paying now, so explore your options. 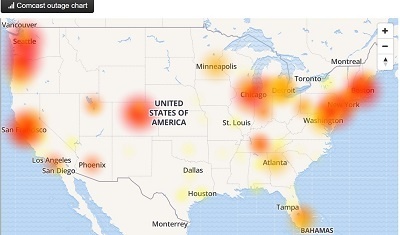 Internet Outages Across the Country Yesterday - What Happened? Yesterday afternoon users across the country lost Internet access for about two hours. Some users had intermittent outages and slow downs, and some lost connectivity altogether. All our clients with Comcast Internet were affected and we were on the phone non-stop talking to businesses who were disrupted by the outage. The map above from downdetector.com shows the impact was nationwide. The disruption lasted a little under two hours, but for businesses that rely heavily on the Internet for email and other mission critical business applications, that was a LONG two hours. The outage started around 1pm and was mostly resolved a little after 3pm. What caused the problem? A misconfiguration at Level 3, an internet backbone company - and enterprise Internet Service Provider (ISP) - that underpins other big networks. In our area, the affected users were all on the Comcast network, but the routing issue at Level 3 created a ripple effect, causing problems for companies like Spectrum, Verizon, Cox, and RCN, in addition to Comcast across the country. 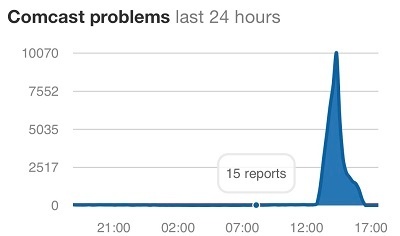 Internet outages like this have occurred occasionally and consistently throughout the decades, but no system is fault proof. To learn more about the details, wired.com has an excellent summary of more of the technical details. Monday's outage shows how precarious connectivity is in our highly connected world. When the outage first occurs, getting accurate information is challenging, and its important to know if the problem is inside or outside of your network. What can you do? A secondary Internet connection can help in most cases. Advanced business class firewalls can support two connections, and fail over as needed. Also, you can use your phone for email and web access through your wireless carrier. An outage like this is a good reminder to put a solid disaster recovery plan in place.